Comfort: Unlike a normal mattress, a waterbed mattress can be customised to perform exactly how you want it to. The amount of motion you experience when getting into a waterbed can be fine tuned by the use of polyester stabilisation layers. Meaning you can have a full motion waterbed or a motionless waterbed and anything inbetween. A motionless waterbed mattress feels like it is filled with a thick liquid gel and reacts slowly to your movements. 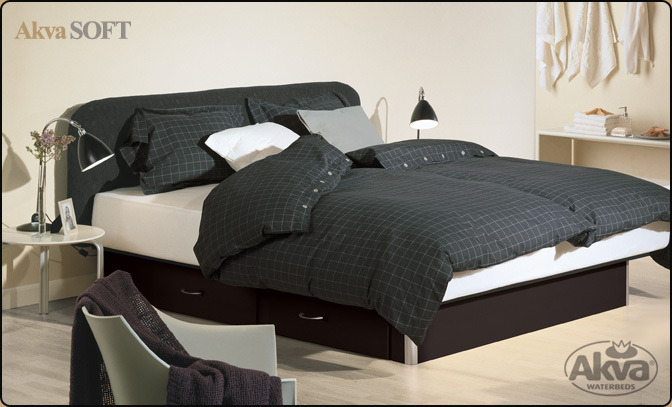 The temperature of the waterbed mattress is set by you with the built in luxury heating system. All of our waterbeds can also be fitted with a state of the art massage unit if you wish to relieve any aches, pains or stress. Health: Many studies show that an uninterrupted full night of sleep on a regular basis can improve many health problems. A waterbed mattress gives you full, even, temperature controlled support across your whole body as you sleep unlike a normal mattress which creates pressure points and poor blood circulation. Waterbeds are especially helpful to Asthma sufferers and people with arthritis. This is just a summary of the benefits of owning a waterbed. Please read our Waterbeds and You section for more. Why are we different from other waterbed retailers? We have the largest stock of Akva waterbeds in the UK. We only sell and deal with waterbeds so we have become experts in our field. All of our staff own and sleep in waterbeds themselves so we can give first-hand knowledge and honest advice. We have over 25 years of experience to help you choose the right mattress and waterbed for your individual needs. We stock a large range of different mattresses; many shops only stock one mattress type. Many waterbed accessories and spare parts are kept in stock and are available either by collection, post or delivered by us direct to your doorstep. Unlike many others, we can fit, maintain and if required move any waterbed ourselves, whether you bought your waterbed from us or from someone else. Because we care. We have an excellent after sales relationship with our customers to make sure they are enjoying their waterbed experience to the fullest. We are always there for advice and any questions you may have. A waterbed is unique to it's owner so it is always best to try out our waterbed range at our Newport showroom. Many people come into our store with one type of bed in mind and end up leaving with a different product after trying out the different mattress types and motions. We are experts when it comes to Waterbeds, with our advice and information, we can help you find the perfect waterbed for your needs. We have a range of accessories to keep your waterbed in perfect working order. From waterbed conditioner to DIY repair kits. We believe Akva waterbeds are the best in the world. Waterbeds at George Street has the UK's largest range of these fantastic beds. Browse our Akva Gallery to find out more. Aquastar stands for quality, luxury and innovation. They are the largest manufacturer of waterbeds in the UK. Browse our Aquastar Gallery to find out more. Waterbeds are proven to help you sleep; they reduce back problems, help asthma sufferers and have many benefits that are good for your health. Find out more about waterbed health benefits. With more than 25 years experience in total, we pride ourselves on giving our customers the best possible service and advice. Feel free to send us a message or visit us or call us on 01633 211448. Expert advice and information about buying, using and owning a luxury waterbed.